These evaluations published in medical journals of reference are very important. They prove the effectiveness of the microkinesitherapy. They were carried out with a strict scientific protocol. These protocols are normally used to validate the medicines and the microkinesitherapy accepted to submit to these evaluations. These evaluations were carried out and validated by professors, researchers and laboratories in medicine and biology.They were then reviewed by the reading committees of the various medical reference journals in which they were published. They prove that scientifically effective microkinesitherapy.Microkinesitherapy is part of the small group of NMIs (Interventions Non Medicamentos) having proven their effectiveness. 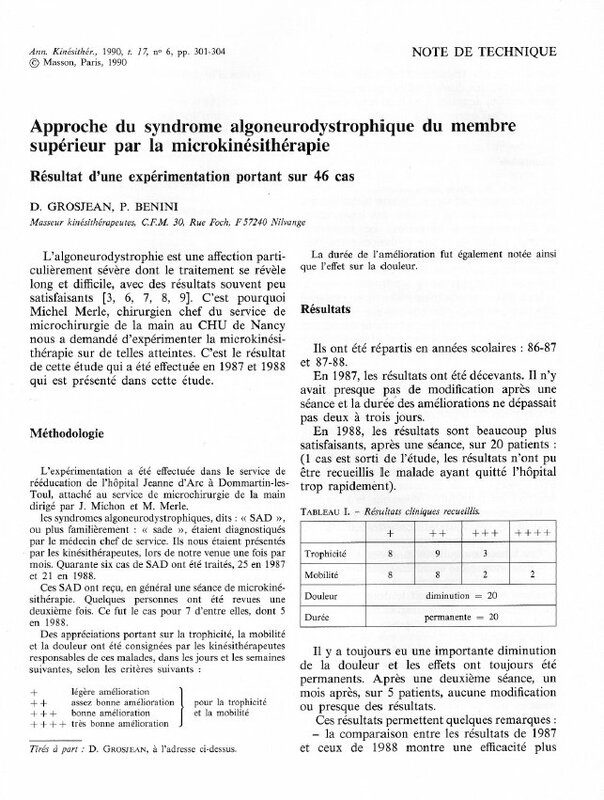 1990 – Approche du syndrôme algoneurodystrophique du membre supérieur par la microkinésithérapie. 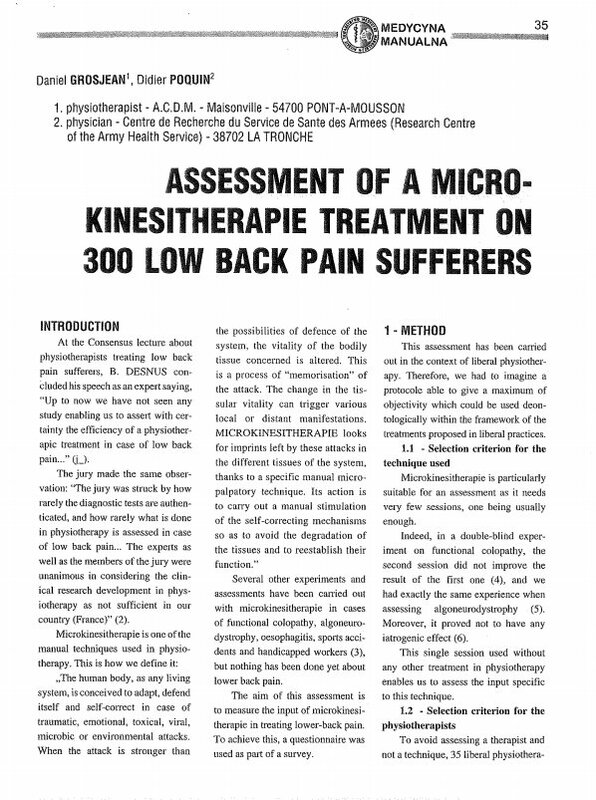 2006 – Assessment of a microkinesitherapie treatment on 300 low back pain sufferers. 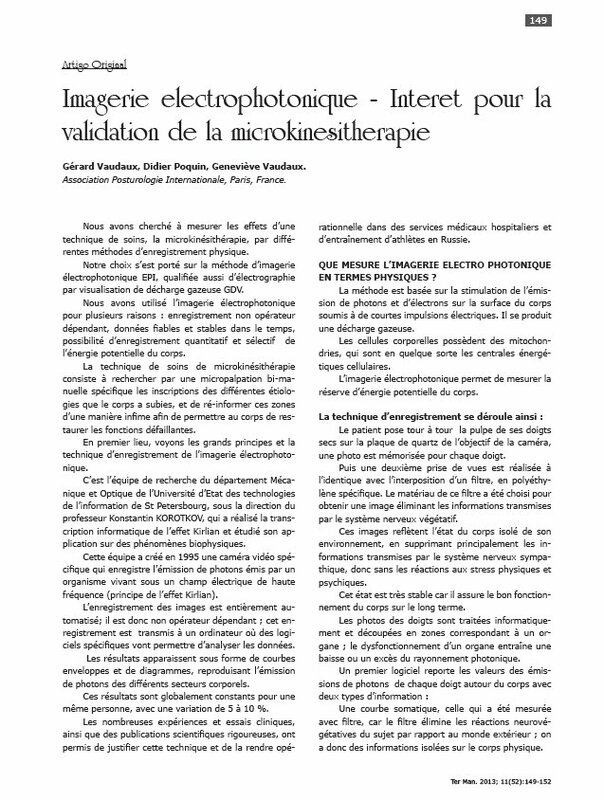 2013 – Imagerie électrophotonique. Intérêt pour la validation de la microkinésithérapie. 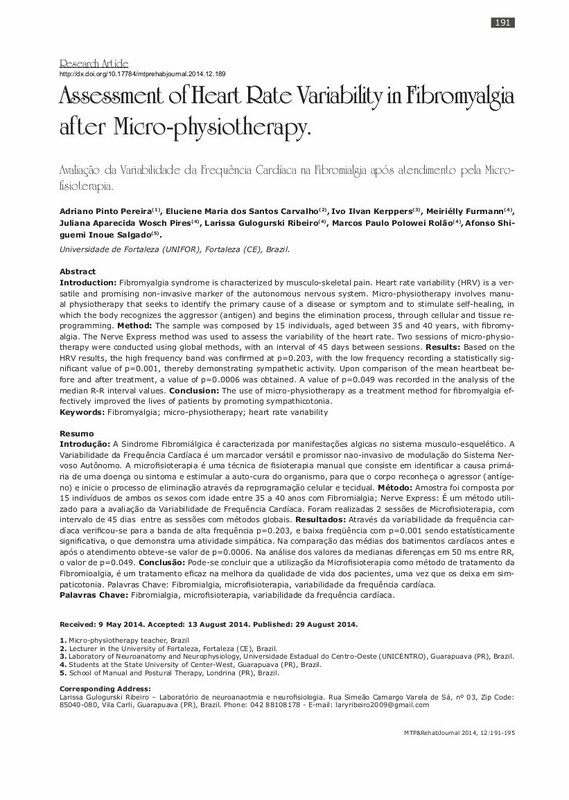 2014 – Assessment of heart rate variability in fibromyalgia after micro-physiotherapy. 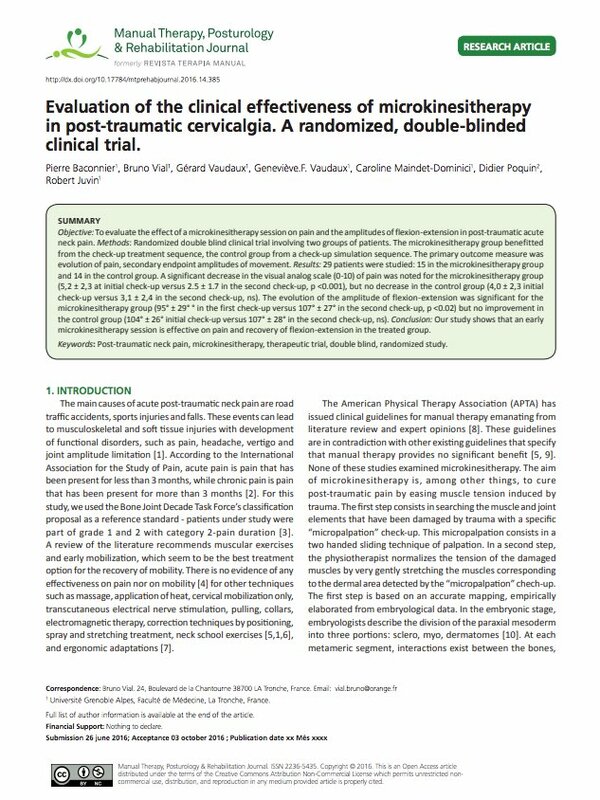 2016 – Evaluation of the clinical effectiveness of microkinesitherapy in post-traumatic cervicalgia. A randomized, double-blinded clinical trial. 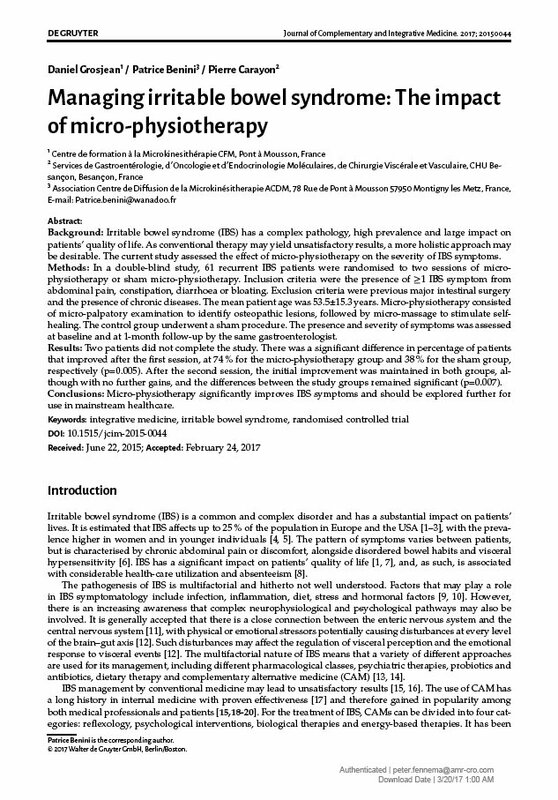 2017 – Managing irritable bowel syndrome: The impact of micro-physiotherapy. Grosjean D., Benini P., Carayon P, “Managing irritable bowel syndrome: The impact of micro-physiotherapy”, J Complement Integr Med. 2017 Mar 16;14(2). pii: /j/jcim.2017.14.issue-2/jcim-2015-0044/jcim-2015-0044.xml. doi: 10.1515/jcim-2015-0044. 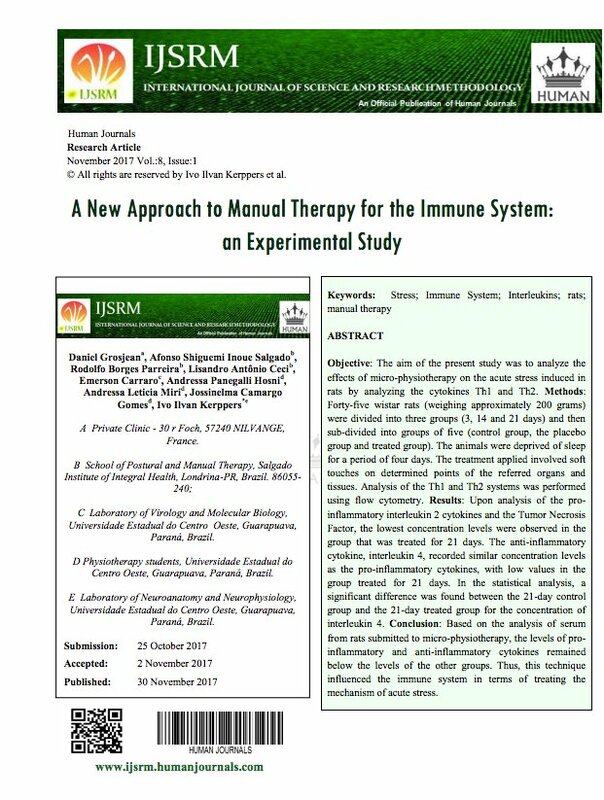 2017 – A new approach to manual therapy for the immune system: an experimental study. Ivo Ilvan Kerppers et al.